How to make a group of people with similar skill sets feel like a team? How to align the objectives of those ‘team’ members? How to ensure they support one another in achieving their team’s objectives? How to get people to buy in and own the objectives and not just have them feel they have had them delegated on them by their managers? … oh and how to get people to actually participate and enjoy the process of establishing their objectives! This Vision led on to the Impact Mapping, using lots of post-its and a very long wall! We brainstormed as a group for the Why (and the measures), the 'Who' and 'How', then did a think-pair-share for the 'What'. Why: To support the vision the team had defined for itself, we brainstormed the biggest roadblocks that were preventing us from realising it. This ambitious problem statement became the high level goal, that the team should be focussing for the next 6 month period. In this case the team broke the this down into 4 areas that formed their team vision; 'Quality', 'Integrated', 'Customer Centric' and 'Fast'. Measure: I emphasised quantifiable and actionable measures to support the overall goal and the 4 sub-areas the team wanted focus on. How would we measure the difference that was (or was not) being made? What numbers would we use? What would we expect to observe when moving toward the goal? We looked at what would be a good thing to measure to support each of the 4 areas, and then looked at what that measure was today and an ambitious target for the next 6 months. If we did not know a measure, we made a best guess, and took and action to review. We agreed it was better to start with something. The first 2 were relatively straightforward to put a number against, for the 3rd we used feedback from key people who were involved in the deployment process. The team held a retrospective following each deployment, and decided to use a rating of 1 - 5 for feedback, where 1 was “let’s never deploy again…!”, to 5 which was “when can we do that again ? !” The measure was to increase the feedback so the minimum was a 4. 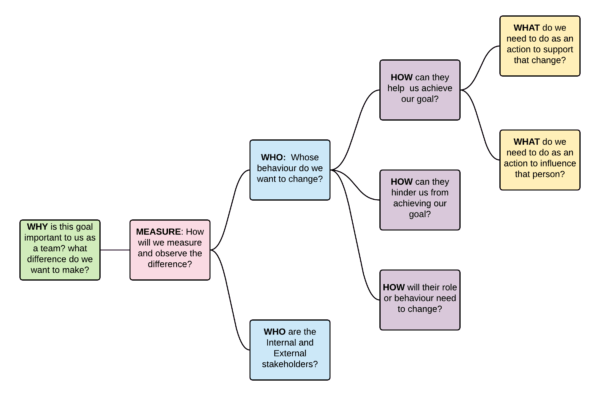 How: How can the stakeholders identified support the team in achieving their goal? Are these stakeholders likely to obstruct or hinder the team? How would the stakeholders role or behaviour need to change? Deployment team members volunteer to do our digital deployments! Release Manager: use our deployments as examples of how it should be done across the organization! What: We then looked to identify the actions and deliverables that would help realise that role or behavioural change in the stakeholders(s), or help avoid that behaviour if we feel they may hinder us! 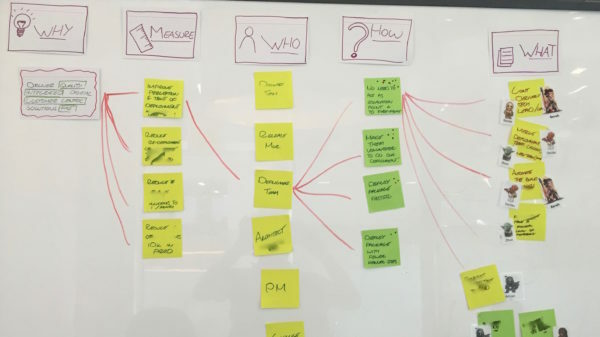 The approach works really well, and it proved to me that Impact Mapping is a great collaborative approach for team as well as product planning. It created a shared purpose for the team, as well as group buy in to the actions. The map ended up being a living plan with more ‘Whys’ and measures than a product map, which meant the team had to focus on the ones they dealt would deliver most value first. Through establishing a set of measures for the team, it meant they did not game one particular number. By visualising the plan it meant the team could check in and review measures and progress periodically at their team meetings. Objectives weren’t just filed away in a drawer for 6 months…oh and the participants? they loved the session!